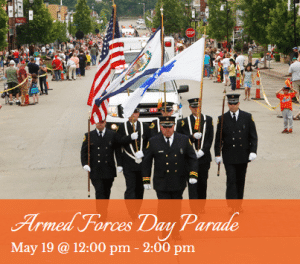 Join the City of South Charleston, WV for the annual televised Armed Forces Day Parade on Saturday, May 19, 2018. The 58th annual parade will feature more than 100 military units. It begins at noon and will travel up ‘D’ street. The Armed Forces Day Parade will be shown on WQCW-TV on May 26 at 12 noon, May 27 at 11am and 12:30pm, and on May 28 at 7am and 7:30am. Call Bob Anderson at the SCCVB at 304-746-5552.